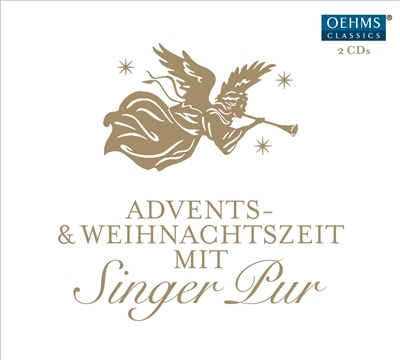 We can enjoy the time before Christmas with this CD containing24 selected, newly arranged sacred and secular carols for the Advent season - just the thing to get into the mood for the up-coming Christmas festivities. Since its founding in 1991, the ensemble Singer Pur has developed into one of the leading a-cappella formations active today. These former members of the Regensburg Cathedral Boys' Choir and their soprano have been honoured as musical ambassa-dors of the City of Regensburg with the Cultural Prize of their native city for their indefatigable in-ternational activities. More prizes followed, includ-ing the coveted Caeciliaprijs (Belgium) in 2013 as well as the Bavarian State Prize for Music. With their brilliant Christmas CD, they have set new standards in the interpretation of traditional Christmas carols, dedicating themselves to the pe-riod before Christmas with the selected carols on their latest CD. Now available as a special edition in a double pack for a special price.